Look at the photo of the poet James Wright [1927-1980] pictured below. As in most of the portraits published of him, he looks pained, and inconsolable--as if some deep sadness or frustration, born beyond endurance, had overwhelmed his sensibility. This was often the mood that Wright's poems evoked, a deep desperation or longing for an escape from some claustrophobic circumstance of life. It is the sentiment that dominated his poetry, especially those poems for which he became famous, collected in the volumes The Branch Will Not Break [Wesleyan, 1963], and Shall We Gather at the River [Wesleyan, 1967]. It may be difficult now to understand the excitement which accompanied the appearance of these two books--published at the height of Wright's career, in the middle of the 1960's. They symbolized a departure not only for Wright himself, a process of grieving and healing following a failed marriage from the 1950's, but for American poetry, and American society, in general. They were like talismans of an emerging liberation, carrying all the impatience of a submerged spirit finally set free. 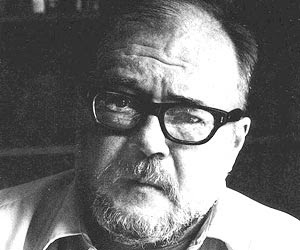 Having begun in the early 1950's writing carefully crafted academic verse (The Green Wall [Yale University Press, 1957], and Saint Judas [Wesleyan, 1959]), Wright, along with his confederate Robert Bly, came under the influence of the European and South American Surrealists, and began to write in a stripped-down, elliptical style, filled with "deep imagery" employing confessionalist personae. These aspects of poetry were perfectly melded into a growing sympathy for the dispossessed, and an increasingly "liberated" point of view. The pressure under which this transformation occurred drove the emotional motive-force of the work, resulting in dozens of memorable poems, mostly in an elegiac mood. Out of the despair of his personal disappointments and regrets came a stream of bitterly wrought, frequently ultimate-sounding pronouncements (poems). Halting declarations and admissions were earned, however, through the delicacy and earnestness of a style at once direct, and metaphorical. Tilted and strained by wind. Inside the dream, I dreamed on. Faint mosquitoes near still water. So I waited, in my corridor. In its way, this poem exhibits most of the hallmarks of the "deep image" style for which Wright (and his colleague Bly) became noteworthy: The use of "dark" imagery (the "dark building");the use of generic nouns to evoke basic concepts and relationships; irrational or supernatural "surreal" events--in this case perceived after the death of the speaker, the mood of anguish or mournfulness common to the traditional Keatsian ode. Wright is a romantic in a post-Romantic world, a world of apocalypse and shame, demeaning condescension and raw violence. The poems bear all the scars and wounds of an embarrassed and debased innocence, and ask us to share in the speaker's self-pity and despondency, his poetically inspired pilgrimage through the purgatorial nightmare of his search for redemptive love and acceptance. Wright's poems have a loneliness about them which is often endearing and attractive, especially to those who may share, or be seduced by, the aesthetically comforting approach. The forsaken or "given up for dead" mood of much of his work is like a prayer, relinquishing sensual or intellectual pleasures for the hard edge of denial, resignation and acceptance of oblivion. This saintly aspect of Wright's work is both its strength, and its potential weakness. We must accept the fact of the speaker's desperation and determination not to be deterred by any consolation, or by the presumption of a pain that exonerates the speaker from any charge of trivial, indulgent devotion. If one is willing to accept that the speaker in a Wright poem deserves to feel as hopeless or angry at his life, or at the world, as he appears to be, then the probing, grim atmosphere of his poetic landscape is perfectly appropriate. The function of such poetry is the degree to which it can convince us of the intensity, or justice its pity. In the famous lines by Wilfred Owen, "the Poetry is in the pity." "Yet these elegies are to this generation in no sense consolatory." "Above all, I am not concerned with Poetry. My subject is War, and the pity of War." Wright was only 53 when he died of cancer. The pitiable fate which had been the underlying subject of much of his best work, ironically was fulfilled. Is Wright's best work the record of an overwhelming sadness unredeemed by a visionary salvation? Or does he attain that state of illumination or super-awareness which yields insight into the deeper meanings of existence? Poised on the edge of his mortality, salving his emotional wounds with strange short spells or incantations, Wright offers us honest feelings and sensations: a spider's white skein floating towards a barn through snow; the hum of mosquitoes near still water; the faithful horse waiting for his rider. Even in death, these bits of data, impressions, memories float up out of the unconscious like vestiges of a previous, lost existence. They are what we do have, and what we will have, for eternity. Wright's poetry is both an argument for, and a proof of, the value of such feelings and experiences. They are raised out of the mundane into the miraculous by the pressure of the moment. The poems bear all the scars and wounds of an embarrassed and debased innocence, and ask us to share in the speaker's self-pity and despondency, his poetically inspired pilgrimage through the purgatorial nightmare of his search for redemptive love and acceptance. poetic I'm not but recall some of Wright's work from somewhere and it sounded pleasantly morose...unlike most beatCo hysteria or TS Eliot theatrics. Not sure it's quite as subjective as you suggest...sort of like spoon river anthology stuff (yes a bit trite...but whatevs), graveyards in the midwest winter, children of the corn, etc. Yeah, I think I'd agree here. It's a slightly negative account, but probably as accurate as my overarching descriptives. 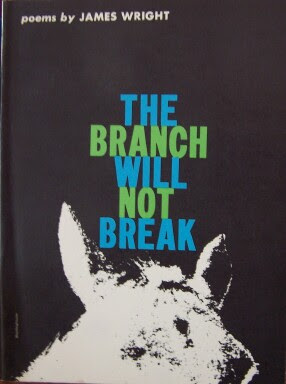 Wright's The Branch Will Not Break was my 'gateway drug' into poetry. Very interesting post. Came across your blog looking for a copy of this poem. I would suggest, though, a slightly different reading of the poem. I would say that unlike earlier poems in the collection, "I Was Afaid of Dying" and "A Dream of Burial" are poems of absolute relief. Throughout The Branch, the narrator (who I struggle to separate from the poet himself) constantly comes up against the realization that he is outside of nature and cannot access it in the way that he sees the animals live. The title poem is a good example of this or "Lying in a Hammock at William Duffy's Farm in Pine Island, Minnesota." In the last line break of A Blessing, though, this changes. His fear of death changes. His feelings of being outcast from the natural world changes. He sees that in death, through death, he can approach nature as an insider. The end of A Dream of Burial, after this reading, is almost joyful for Wright (the narrator). He has done it. He's here. The sea now knows him. He now knows intuitively that a horse awaits to bear him away. As he withers in his coffin he becomes more in tune with the natural world, the thing he has always wanted to enter and the suspense of death is now absent. There is victory, here, I think. Just something to think about. I liked your post. Thanks for having the poem up.